Between Main and Prospect streets, right next to the Old State House, rises a historic landmark, the Travelers Insurance Company Tower. The Travelers Tower in Hartford stands on a spot where there was once a tavern. In this tavern, during a dispute between colonials and royal officials, Connecticut's royal charter disappeared. The charter, which granted powers of self-government to the colony, was spirited away secretly by colonials unwilling to yield their self-government to the king and hidden in the cavity of a nearby oak tree. The "Charter Oak" became famous as a symbol of Connecticut's—and America's—unwillingness to be governed by a parliament in London in which the colonial peoples had no representation. The king's men ruled Connecticut illegally for a time (they could not find the charter and thus could not destroy the legal instrument of Connecticut's self-rule), but the charter survived, and it's now on view at the State Library next to the State House. 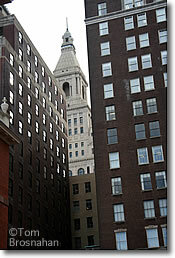 Travelers Tower peeks between two other tall buildings in downtown Hartford CT.